All About Me Cube - [ K-1 ] - Bring the family and the school together in a homework lesson. Group Cooperation - [ K-2 ] Supports social and emotional development, as well as providing positive guidance. My Memory Box - [ 1-2 ] Allows young children the opportunity to verbally express themselves while using concrete materials of their choice. 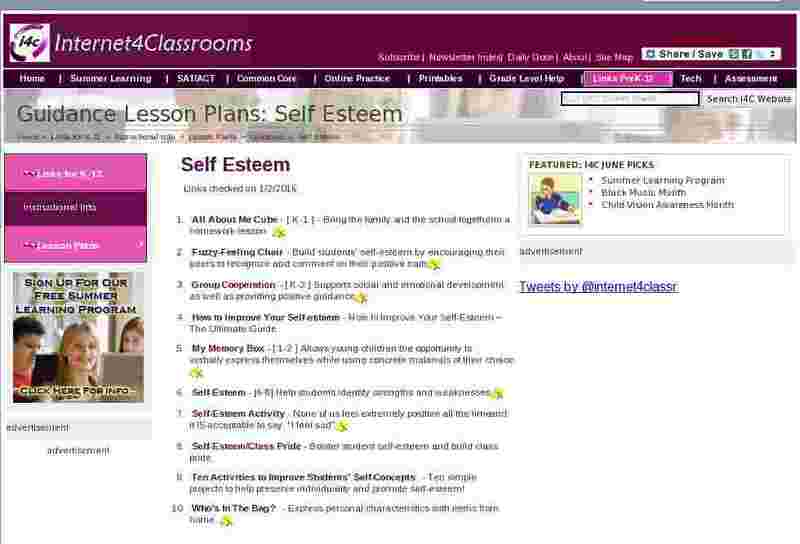 Self-Esteem - [6-8] Help students identify strengths and weaknesses. Self-Esteem Activity - None of us feel extremely positive all the time and it IS acceptable to say, "I feel sad". Self-Esteem/Class Pride - Bolster student self-esteem and build class pride. Ten Activities to Improve Students' Self-Concepts - Ten simple projects to help preserve individuality and promote self-esteem! Who's In The Bag? - Express personal characteristics with items from home.